The facts speak for themselves. We can actually save lives by requiring background checks on all gun sales. 20 years ago today, the Brady law was passed. It required that federally licensed firearms dealers perform background checks on sales of guns at their stores. A federal data base was established ( NICS) where the information about who is prohibited from buying guns is kept and easily checked ( in just a few minutes) so a seller knows who cannot buy a gun. The system works well and has kept a lot of people who shouldn't have guns from getting them. We know this because we have records of who has tried to buy guns. Interestingly, people with felony records actually try to buy guns from licensed dealers. Where do they go when they are prohibited? Easy. They can simply go to a flea market, a gun show or now, to the Internet where they can find the same guns sold by licensed dealers only with no background check. Does this make sense to you? We have one place where no background checks are required ( about 40% of sales) and one place where they are. This would be like allowing about 40% of airline passengers to go without the TSA screening and board planes anyway. I am quite sure this would be a terrible idea given what happened on Sept. 11, 2001. But we let it happen anyway. Why? Because the corporate gun lobby has a vested interest in assuring that gun sales happen no matter what. If we follow the money we can see the connection between the gun industry and the gun lobby. If we let money and profits be the deciding factor over lives, we are doing the wrong thing. Surely we are better than this as a country. When something works, as it does in states that have decided to pass laws to require background checks on all commercial sales, gun deaths are generally lower, women are safer in their homes and no one is "punished" except those who shouldn't have guns in the first place. "Law abiding" gun owners can still buy their guns. Dealers can still sell their guns. Private sellers can still sell their guns and make the profits they desire. Seems like a good idea to me. Why would we protect the bad guys anyway? Once again, here is the video from the Brady Campaign about how easy it is to buy a gun with no background check and how easy it would be to expand Brady background checks to all commercial gun sales. So the time is now to ask Congress to finish the job started 20 years ago today. Please contact your representative and/or Senator and tell them how easy it would for them to support the good guys. It's only common sense. While they are dallying lives are being lost every day to bullets. This is senseless and avoidable. When something supported by so many citizens, including gun owners and NRA members is ignored by Congress, we know something is not right. 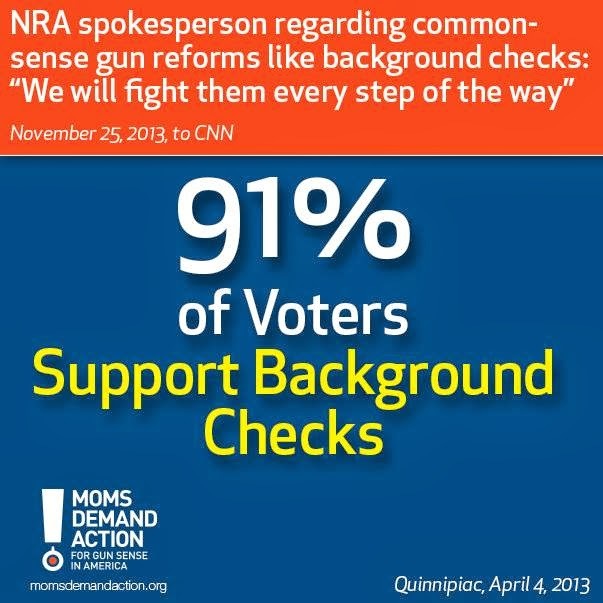 Fighting background checks makes no common sense. There is simply no reason that makes any sense for the corporate gun lobby to be opposed to background checks on all gun sales. But they are anyway. 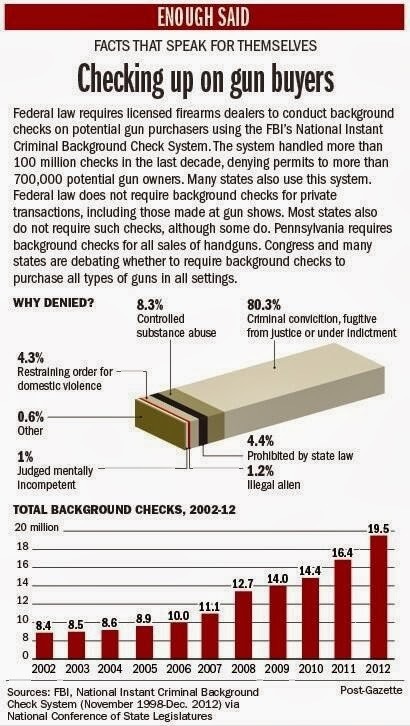 They make up reasons like private sale background checks would lead, inevitably, in their minds, to registration. We know that is not true because in 20 years, the system we have in place has not led to registration. But never mind. That is the nonsensical argument put forth. The wording of the proposed law, in fact, expressly forbids a registration system. But never mind the facts. It's time to base our public health and safety policy on facts. Let's get to work. Finish the job. You said "They can simply go to a flea market, a gun show or now, to the Internet where they can find the same guns sold by licensed dealers only with no background check." This is a blatant lie. A licensed dealer has to conduct a background check no matter where he sells a gun. For you to say otherwise is to knowingly use deception to further your goals. You also mention all the "felons" that have been stopped from buying guns by the Brady Check. You don't mention that 95% plus of these denials are false positives and that there have never been 100 people a year prosecuted for attempting to illegally buy a gun. You also refuse to meet gun owners half way. We have repeatedly stated that if there were a mechanism that didn't require going through an FFL (most of whom will not do a check for a gun they aren't selling) and didn't cost us money, we would use it. Robin- no you are the one who is being deceived. There are no background checks required for private sellers at gun shows. Period. They are selling the same weapons as those sold by FFLs at the very same gun shows. We have ample evidence of that from all of the hidden camera videos taken at gun shows. It is also a fact that guns are available on-line through places like Armslist.com where sellers advertise no background checks. They meet their sellers in parking lots or other such places to transfer the guns with no background checks required. I don't know why you guys keep making this stuff up. You are wrong. 80% of those ( as shown in the graph on this post) denied are denied because of a felony record of some kind. And that is a fact. I don't know why you keep denying this. Why not just admit it? Or do you want felons, adjudicated mentally ill people and domestic abusers to have guns? That is the only answer I can think of that makes any sense. And there are perfectly good explanations that don't fit with the NRA scenario for whey there are some gun crimes that are not prosecuted. It isn't because the person wasn't guilty. We have gone over that before on this blog. No one has refused to "meet gun owners half way" Didn't you see the quote in this post? 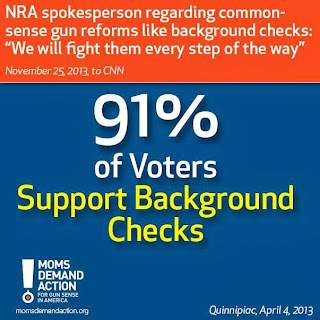 The NRA lobbyists and leaders refuse to be in favor of background checks on all guns sales- period. If you think that is meeting anyone half way, you have a very strange view of the world. But then........ No one has come up with a way to do what you are suggesting. Go for it if you think it would work. But so far, have seen no serious plan to allow this mechanism you suggest. It's working just fine in the states that require background checks on all gun sales at gun shows for the private seller to bring the gun to an FFL for the check. Easy peasy. So if it's this easy and FFLs don't object, which I haven't heard that they do, why not just do it the easy way? If a private seller wants to submit to all the regulations required by the ATF to be a dealer, then perhaps that is the way to go. How do we know that a private seller is law abiding? We don't. So quit your ridiculous assertions. They are not true. Don't call me a liar. You are the one who is being deceived and then call the rest of us liars as if that solves the problem. If you do a little thinking you will see that your are wrong. Have a nice day and don't bother to respond. I'm done with your false comments. I can only attest to the gun shows that I have been at. Every show has more than one ATF agent that verifies the FFL paperwork for dealers and questions the private sellers and makes sure that they are not making a business of selling guns. If they are making it a business, the guns are confiscated and the table is closed. Also there are ATF agents that pose as buyers for the people that walk in the show with a gun and sign. I have seen sellers refuse to sell to people that did not have CCW that they could produce. So, yes it happens, but mostly between people that know each other. Out of 500 tables, there may be 3 or 4 private sellers and most of them are selling antique guns at very high prices. All it takes, TopCat, is a few felons, minors, straw purchasers, domestic abusers or other prohibited people, to buy one or more guns from one or two of these private sellers to cause a lot of death and injury. Columbine, is one example (http://www.vpc.org/studies/wgun990420.htm) The shooting at the Milwaukee spa in Oct. 2012 is another- http://www.motherjones.com/politics/2013/01/want-buy-gun-without-background-check-armlist-can-help This was a case of a prohibited individual easily getting a gun through an Internet sale. You are talking about one gun show. Gun shows all over the country in many communities have private sellers who sell guns with no background checks. Gun shows occur many times a year in the same venue. If you don' t think that stopping people who shouldn't have guns from being able to get them anyway, you must think it's OK for these folks to have guns. With so many gun shows in so many venues operating multiple times a year, there is ample opportunity to buy guns for someone who wants one who shouldn't have one. Preventing prohibited people from having guns will prevent some of the shootings in our country. The facts speak for themselves. I am not sure there is an ATF agent at every gun show in America. According to this - http://en.wikipedia.org/wiki/Gun_shows_in_the_United_States- 50-75% of exhibitors at gun shows have federal licenses to sell guns as estimated by the ATF. That leaves a lot of folks selling guns to people without requiring a background check. Yes, there are sellers who refuse. And yes, there are sellers who don't. We have evidence of that in the many hidden camera videos of gun show purchases. And those examples were not of people who knew each other. I agree, we have about 3 gun shows a month in this area, between Fort Worth, Dallas, and the smaller communities in the MetroPlex. The bigger shows usually have an hour wait at the door and attack maybe 10-30 thousand people. Not sure how it is in other parts of the country. Here the shows are dominated by commercial sellers that are known nationally. We have about 20% of the tables that do not sell guns, These sell food, accessories, clothes, ammo, and training classes. (I know that I have spent more money on food that guns at gun shows) After all it does not take much skill or equipment to build your own guns so if it sources dry up from other channels, we will see the criminal gangs make their own. And I am talking about conventional tools, like what you would get from Sears. In almost every state it is legal to build a gun from your own use. My point is that there is very little that any law can do to prevent guns in the hands of criminals and crazies. So, if we want to reduce violence we need to work on the other side of the equation. That having the good guys (including police) better prepared to deal the bad actions these people take. Since we know that about 40% of gun sales go without background checks, requiring them wherever we can would result in fewer guns in the hands of criminals, domestic abusers and others. This would help to dry up the market for illegal guns. Doing so would make fewer guns available to use in shootings. This is one way to prevent shootings. There are others. But there is absolutely no proof that "good guys" with guns would or have stopped shootings. In fact, the opposite is true. "Good guys" with guns shoot people every in domestic shootings, or allow children and teens to access their guns which get used in unintentional shootings or suicides. Also, accidental discharges by "good guys" have caused a fair amount of gun injuries and deaths. There are plenty of "good guys" with guns who become "bad guys" in a matter of seconds. That is what I write about every day. Notice that I am not writing about the "good guys" with guns preventing crimes or shootings. They happen but far less frequently than the daily shootings occurring in our country. The false idea that a "good guy" with a gun can stop a shooting is a non starter. 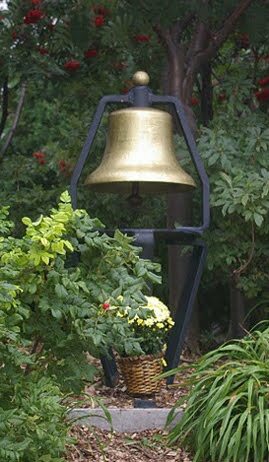 We all know that the mass shootings and daily shootings are often total surprises with no time to react. Even police officers can't react in some cases. Take the shooting of 4 police officers in a Tacoma, WA coffee shop. They were "good guys" with guns and couldn't save themselves from a "bad guy" with a gun intent on a surprise attack. ( http://en.wikipedia.org/wiki/Lakewood,_Washington_police_officer_shooting) Your theory is incorrect and the facts bear that out.